U2 members did a Facebook interview recently answering fan questions and inevitably, they were asked not to ever do another iTunes automatic album deal. The fan asking the question described it as “rude”, which really ticked the members. 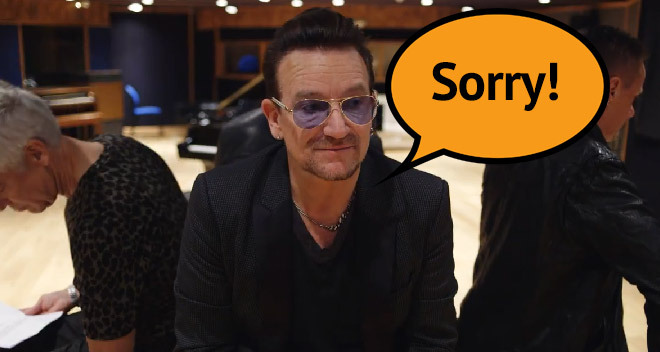 However, after that Bono went on to apologist on behalf of the group. The band’s front man said he was sorry and that U2 got “carried away” as they were concerned that the music they’ve poured years of hard work into might remain unheard. Still, the $100 million deal between Apple and U2 is unlikely to drop. U2′s latest album Songs of Innocence was downloaded automatically by every iTunes user following the update to iOS 8. The album reached 81 million users, many of which were angry at Apple for not giving them a choice whether to download it or not and the company had to create a special tool for removing it.